Two questions suggest themselves with regard to the broken teeth of Marilyn Sheppard: 1. Is the shape of the break consistent with and only with a fracture of the tooth by a pull outward? 2. What is the magnitude of the force necessary to break a tooth completely off close to the gum? 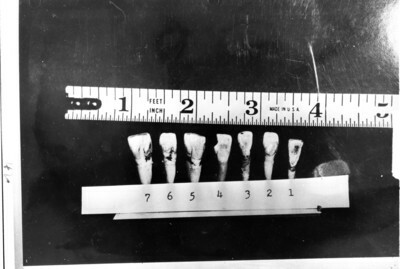 To answer these questions, a considerable number of human teeth were collected from dentists who had extracted them. Only a portion of some fifteen or twenty teeth were incisors, and the condition with respect to decay and dental repair was quite variable. Seven incisors were chosen for experimentation as shown in photographs No. 42 and No. 43.